The adoption of advanced data analytics by banking provider directly correlates to their asset size. The larger the institution, the more likely they are using advanced analytics to cross-sell customers and steal relationships away from other (usually smaller) institutions. There is a troubling gap growing in the adoption rates of advanced analytics between community institutions and their big bank counterparts. 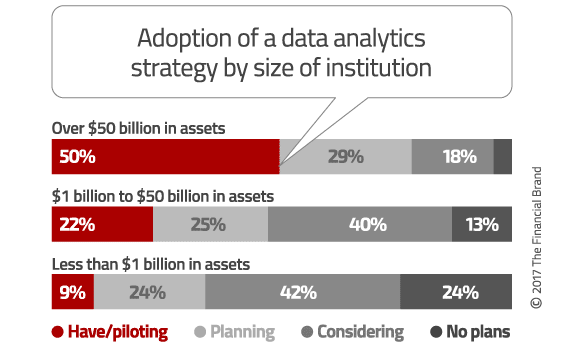 Half the banks with $50+ billion assets have already implemented advanced analytics, but less than 9% of institutions under $1 billion have done the same. Here is another alarming statistic from the Federal Reserve. In the past few years, one of every four community banks has vanished. A similar plight has afflicted America’s financial cooperatives, where 7,165 credit unions in 2012 shrank to only 5,812 in 2017, a drop of 19% in just five years. That leaves megabanks — those with $100+ billion in assets — controlling approximately $3 of every $5 dollars in the U.S. banking system. Leadership teams that don’t see the dashed line connecting these facts might feel comfortable continuing to drag their feet on a data strategy. These two inter-related trends pose a major threat to community banks and credit unions. Reality Check: Smaller institutions that don’t get their data game act together won’t have any future in the banking industry. CEOs at community banks and credit unions must heed this warning seriously. In the old days, small, local institutions offered personalized, hands-on service, but generally waited for consumers to approach them with specific needs. But times have changed, and banking providers of all sizes must now proactively approach accountholders. Banks and credit unions must arm themselves with data to create cross-selling conversations and stimulate needs-based opportunities. The upside sales potential of a data-driven cross-selling strategy can be a source of significant growth for community institutions. For instance, targeting those consumers who only have one account with you not only provides a low cost way to grow deposits and loans balances, it increases customer retention making the relationship more sticky. Of course these single account customers are not a homogeneous group of customers; age, income, product type, age of the account, and usage patterns are all important variables in your database that you must take into consideration when building a predictive cross-selling index. Empowering your analytics capabilities not only means being able to collect and analyze customer data — from both inside and outside the bank — it means being able to inject these newfound insights into your decision-making apparatus and marketing processes. With community banks, members of the leadership team wear many hats. And small institutions have been wrestling with tight operating margins for year, so it’s no surprise that salaries and benefits — the single largest cost center — have been cut. So the first challenge is a lack of bandwidth and internal expertise. Who has the time and the skillset to turn data into actionable insights? This HR gap can also make it difficult to evaluate a reliable external resource who might help shepherd a community institution through an advanced analytics initiative. The relative scale of third-party solutions also create some unique challenges. A typical $500 million community institution might have around 50,000 individual accounts from 15,000 households. But many of the analytics programs being offered by fintechs, cost as much as $50,000 to set up, followed by with monthly maintenance fees ranging between $2,000 and $5,000. This is much too large an expense to be spread over only 15,000 households, making an acceptable ROI realistically unattainable. Provides a strategic perspective, it begins the longer term process of building an integrated functionality that maximizes the value of the bank’s customer data. Value based pricing. A product that starts at the base line for working with data analytics and offers the flexibility to grow and conform to the specific needs of the bank. A means to validate the business case. This means verifying that the additional expense for implementing advanced analytics increases marketing effectiveness to the point that it reduces the acquisition cost per new customer account. Provides the tools to identify segments of customers, their relative value to the bank and the development of predictive measures defined by segment/product to make this information actionable. Being able to fully empower your analytics program requires that you address all these issues. But you’ll probably find the most success rolling out each new functionality in an incremental manner, learning and validating at each step. This will allow you to progress at your own pace while configuring your data analytics program specifically to your own unique needs. Just don’t take too long. Because the clock is ticking, and the countdown to a data-driven Armageddon for smaller institutions is on. Frank Koechlein is the President at Empower LLC and coauthor of the marketing resource book “The New Marketing Analytics.” Frank has over 40 years of marketing experience in the financial services industry, including several senior marketing positions for powerhouse brands like the Dreyfus Corp and Prudential.